58% said climate change is caused by human activity, up from 45% in 2015. 67% of voters are concerned with the latest U.S. climate report, but fewer than half of Republicans (47%) are worried, compared to 87% of Democrats and 65% of independents. More voters in the United States in 2018 think climate change is being caused by human activity than they did in 2015, according to a new survey — but trust in the science on climate change is not shared equally, with Republicans about as likely to consider President Donald Trump a credible figure on the issue as they are scientists. A Morning Consult/Politico poll of 1,975 U.S. registered voters conducted Dec. 4 found that 58 percent of respondents said their view most closely adheres to the perspective that climate change is caused by human action — a 13-percentage-point uptick from the 45 percent who said the same in a Nov. 20-23, 2015, Morning Consult survey of 2,018 voters. In the recent poll, 30 percent of voters said they were most inclined to think climate change is more of a natural phenomenon, down from 37 percent in 2015. The new poll’s margin of error is 2 percentage points. The increase in belief of humans’ climate impact is consistent with other polls: Gallup Inc. surveys of Americans views on climate change show that 64 percent of respondents in March 2018 thought that global warming is caused by human activities — a 9-point increase from March 2015. Large proportions of voters with further education were more likely to attribute climate change to human causes: 71 percent of post-graduate voters said so in the poll, compared to 62 percent of respondents with a bachelor’s degree and 54 percent without a bachelor’s degree. Climate change was on Americans’ minds a lot last week: According to Google, searches on the platform in the United States for the term “climate change” reached its peak for the entire year in the week of Nov. 25 to Dec. 1, which began shortly after the Trump administration released its Fourth National Climate Assessment on Nov. 23. On Nov. 26, Trump told the press he didn’t put stock in the report’s conclusions regarding the potential for billions of dollars in annual economic losses by the end of the century. Environmental Protection Agency acting Administrator Andrew Wheeler and Interior Secretary Ryan Zinke have also cast doubt on the study’s findings. In the poll, which asked voters how much trust they placed in a range of entities or groups on the climate, 31 percent of Republicans said they had “a great deal” of trust in Trump on climate change, while 26 percent of Republicans said the same of scientists. The margin of error for Republican responses is 4 points for each question. Fourteen percent of voters overall, however, said they placed “a great deal” of trust in Trump on climate change — less than a third of the 43 percent who said they place that level of trust in scientists on the matter. Climate change retains a place in the public discourse this week as the 24th Conference of the Parties to the United Nations Framework Convention on Climate Change continues in Katowice, Poland. A higher proportion of Americans (14 percent) say they doubt or deny climate change than their counterparts in the European Union (7 percent) or in China (3 percent), according to recent polling from the European Investment Bank performed in partnership with YouGov PLC before the Dec. 2-14 COP24 began. Sixty-seven percent of voters on Dec. 4 said they were very or somewhat concerned with the projections of the recent U.S. climate assessment, while 24 percent were not at all or not too concerned and 8 percent were unsure. Concern was higher among Democrats (87 percent) and independents (65 percent), while less than half of Republicans (47 percent) said the report concerned them. Voters’ general worries over the environmental impact of climate change held steady from previous polling of 1,968 voters from Oct. 18-19, conducted in the wake of the early-October release of a special report from the United Nations Intergovernmental Panel on Climate Change. 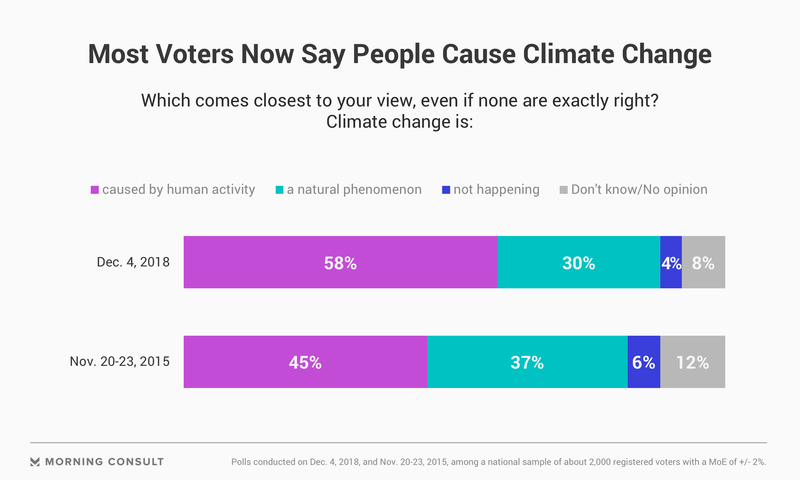 Sixty-eight percent of voters in both October and December said that they are concerned about the climate’s impact, while the number of respondents registering less or no concern increased to 27 percent from 26 percent in October, within the margin of error. Remaining voters were unsure. 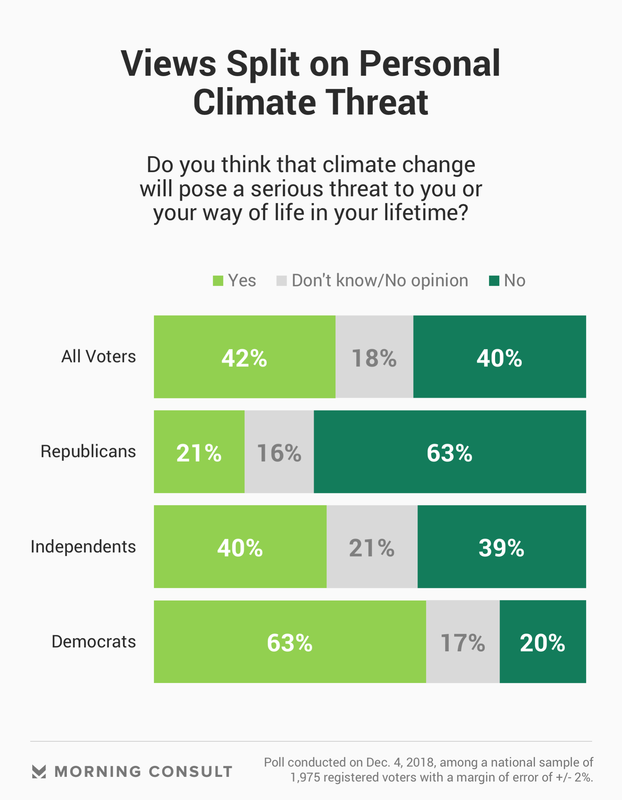 Voters were split on whether they expect climate change to impact them severely within their lifetimes, with 42 percent of respondents expecting it will and 40 percent not anticipating the phenomenon as a serious threat. Eighteen percent said they did not know or had no opinion.